The Parks brochure we had, from an earlier visit to Kangaroo Island, describes Cape Gantheaume Conservation Park as containing ‘vast areas of wilderness, a fresh water lagoon and Seal Bay, the home of the Australian Sea Lion’. However, if you look at a more recent map you will see that the Park is now in two sections, but by far the largest part of the land has been re-gazetted as the Cape Gantheaume Wilderness Protection Area. I was unable to find on the Department’s web site a definition of the various types of protected areas, but a Departmental Officer has promised to send the relevant definitions to me. On the face of it, it appears that a Wilderness Protection Area must contain substantial areas of pristine country. Similar processes have occurred elsewhere on the Island. 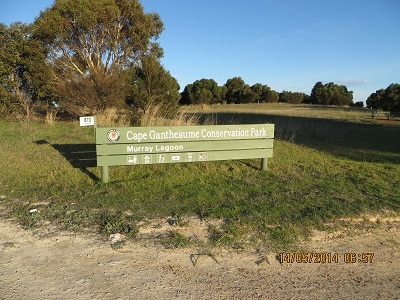 I was able to have seven contacts from this Park before making the trip back to American River, our base for the last four days of our visit to Kangaroo Island. Beginning at 06:12 UTC, contacts were with VK3BHR, Phil; VK5GI, Norm; VK5KGP, Graham; VK5ZAR, Arno; VK5KLV, Les; VK5GJ, Greg and VK5HS, Ivan.